This website is probably the best ACF website I have seen. Everything you want to know plus more! Look at pics of internal organs, anatomy, interesting facts and so much more. Would you like to discuss you ACF even more? Would you like to seek a second opinion from many experienced ACF hobbiests? Then come on over and join this group! It is very active and full of people who keep all types of aquatic frogs, xenopus laevis, xenopus muelleri, hymenochirus, pipa pipa, etc. I help moderate this group and I must say the people at this group are best you could ask for helpful information and ideas. This is a real nice website on ACF. It has lots of pictures and owner stories. It is informative on all aspects of keep the ACF as a pet. This website has awesome pictures of how to set up a beautiful natural environment for you frogs to live in. The frogs pictured here are Xenopus Borealis, so you get to see good pictures of them as well. This is a new site. It is informative and helpful. It also features information on Whites Tree Frogs, as the site owner keeps both species. Also, the site owner occasionally has eggs, tadpoles and froglets avaiable. This website is very informative on the ACF. It is easy to read and is humorous and casual. If you havn't been here before, you must check it out. 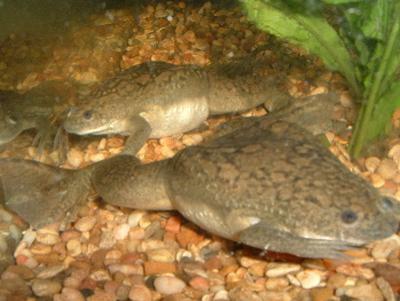 A website that sells many diffrent species of xenopus and pipa. I used to previously reccomend a product called Koizyme for the prevention of red-leg. Now there is an easier to use product called Lymnozyme. You don't have to refridgerate it and it lasts longer then Koizyme. It is more "user friendly" and a great must have for any Clawed Frog tank or POND! I am currently using this product with my frogs. If you have found another highly educational website on African Clawed Frogs please let me know and I will add it to this page.